Written by Admin on January 31, 2018 . Posted in Skin Care. Microdermabrasion is one of the top most performed facial procedures for some years now. Most people will have heard of it and many have tried it for themselves. But do you really know the benefits of Microdermabrasion? In plain terms Microdermabrasion is “The Ultimate Buff & Polish” for the skin, removing layers of built up skin cells, dirt and impurities using tiny micro crystals or sometimes diamond tipped wands along with vacuum suction to loosen and lift away the dead cells to reveal new fresh skin cells. Many factors result in our skin cell turnover slowing down, the two main causes are ageing and environmental factors. As our natural cell turnover slows most will notice their skin appears “dull” and “tired”. Microdermabrasion speeds up this process revealing the new skin cells waiting beneath for a fresher renewed skin. Once the built up dead cells, dirt and oil are removed your homecare products are then able to penetrate the skin up to 50% deeper. If you are using a cosmeceutical skin range you will know these products focus on delivering the ingredients to the dermis to deliver you your results, adding Microdermabrasion into your skin plan boosts the results of your product. Read about our Cosmeceutical Product range here. The vacuum suction component of Microdermabrasion not only lifts the debris away but also stimulates circulation in the skin, delivering oxygen and nutrients to the cells as well as aiding detoxification which is vital to our skin health. The use of a brightening range to help fade pigment as well as Microdermabrasion will boost the results dramatically as the products are then able to penetrate to where the pigmentation actually is. Just because you see pigmentation on the surface of your skin, we need to get these products to the dermis to actually reverse or remove the cause of the pigment. Comedones and blackheads in the skin are all caused by clogged pores. Microdermabrasion is effective in treating congestion by eliminating the dead skin and oil as well. If you combine the use of alpha hydroxy acids at home this will help to maintain the skin. 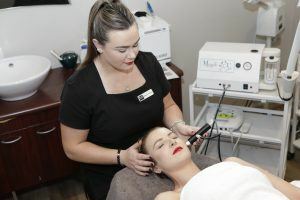 Microdermabrasion retexturizes the skin by smoothing the edges and surface of the scar as well as stimulating collagen to produce healthy new skin cells to aid in the healing of the scar tissue. 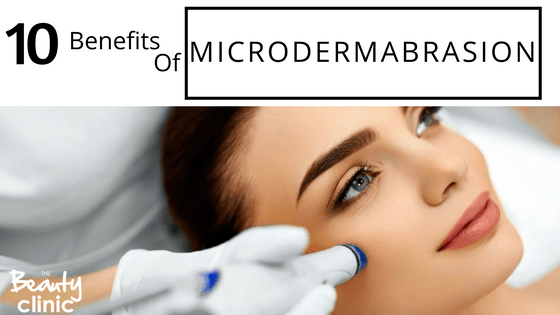 If you are concerned with fine lines and not ready to start invasive treatments Microdermabrasion can reduce the appearance of fine lines and help stimulate collagen as a preventive of deeper set lines. Large pores are usually caused by a high oil flow. Treatments for pore size include controlling the oil flow and keeping pores clean and free of any dirt with regular exfoliation. Microdermabrasion is the ultimate exfoliation. Microdermabrasion is a non-invasive treatment being performed only on the epidermis (outer layer) of the skin, with no ‘down time’ and with only a few small aftercare protocols to follow. This makes Microdermabrasion the ultimate Pre-event Facial.